We're honored to feature Glen Armstrong's "The Bedside Book of Threadbare" in Issue One of Orson's Review. We're also very fortunate for the time Glen took to sit down and chat with us about his journey as a poet. 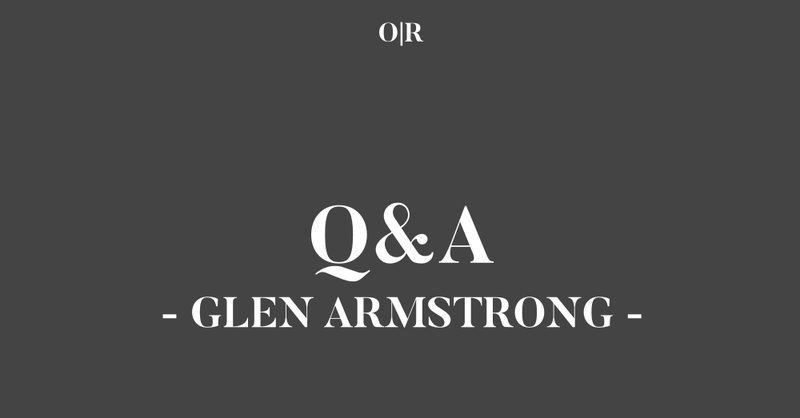 *The following interview involves Orson's Publishing (OP) and Glen Armstrong (GA). GA: I remember my mom taking time to notate stuff I had planned out in my head before I could caption my own Crayola drawings. GA: I teach at a University to pay the rent. OP: What about "The Bedside Book of Threadbare" are you most proud? GA: I like that it balances the quixotic and the just plain nuts in a modern setting. GA: I get out of bed, brew a cup of coffee and write until I have to start off to work. I try to draft a twenty-line poem every morning, which might be more like running scales or etudes than truly completing a poem. The resulting manuscript reads a bit like a diary. At other times, I’ve been obsessed with revision. GA: I wanted to be a trombonist. It seemed like something the world needed, something that could do no harm. I suppose I had an intuitive sense that there was something called “the arts” and making things for other was a possibility. GA: Though writing connects us to others, the amount of practice that I feel I need has compromised most of my relationships. GA: 24 -30. I wish it were more. GA: One of my favorites was hearing James Tate read from Worshipful Company of Fletchers just before it won the National Book Award. He seemed as amazed at where some of those poems wanted to go as we were. It wasn’t about self-promotion or a lesson in the writing process. It was just a trip to these cool little planets. GA: I’m not sure. An MFA degree isn’t something we look for when we choose poems for Cruel Garters, the journal that I edit with Ben Bennett-Carpenter. GA: With a little luck, I’ll surprise myself. Something unplanned will raise its mongrel voice. GA: I have a couple collection and a couple longer poems that I’d like to see settled in with the right publisher. Be sure to check out Glen Armstrong's "The Bedside Book of Threadbare" in Issue One of Orson's Review.